Are you sick of the mess associated with baby led weaning? Are you constantly struggling to get food stains out of your baby’s clothing? Me too. Over the course of having my four very messy babies, I have been on a constant quest to find “the answer” to this age-old problem. Do you know what? I think I now finally have it sussed. I was asked to collaborate with a company called Bibado, who claimed to have the answer to minimising meal time mess. 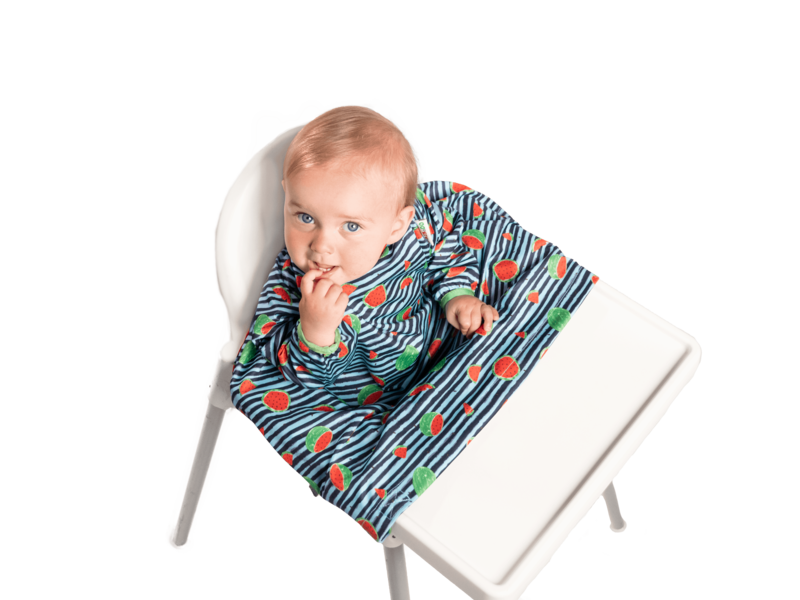 BIBaDO is the only coverall you will need for your little one’s whole weaning journey! I was certainly keen to get involved and investigate further, partly because such a promise seems too good to be true and partly because they are a fellow Welsh small business. I was also a little nervous. As with all of my collaborations, I only work with companies who supply products that I genuinely love and hand on heart use or believe would improve the lives of my tribe. What if this bib didn’t live up to the hype and I’d have to tell this little Welsh company that I couldn’t endorse them? Awkward. 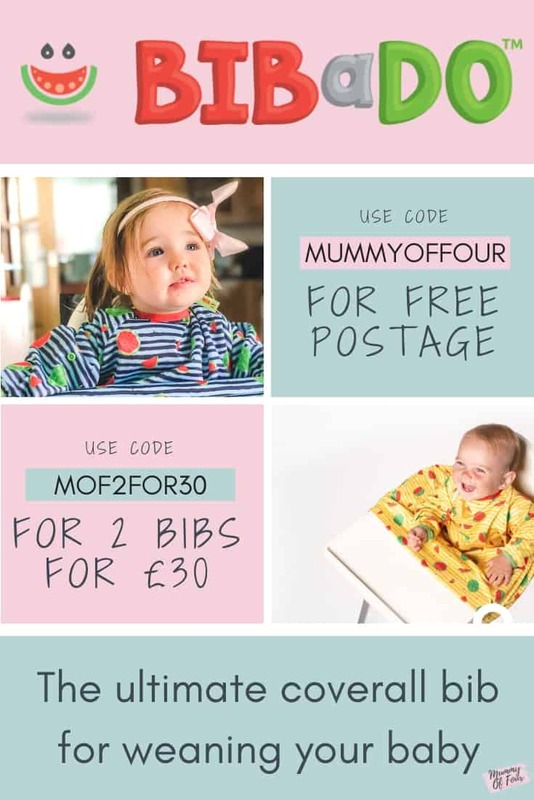 I have tried a lot of different bibs (and I mean A LOT). 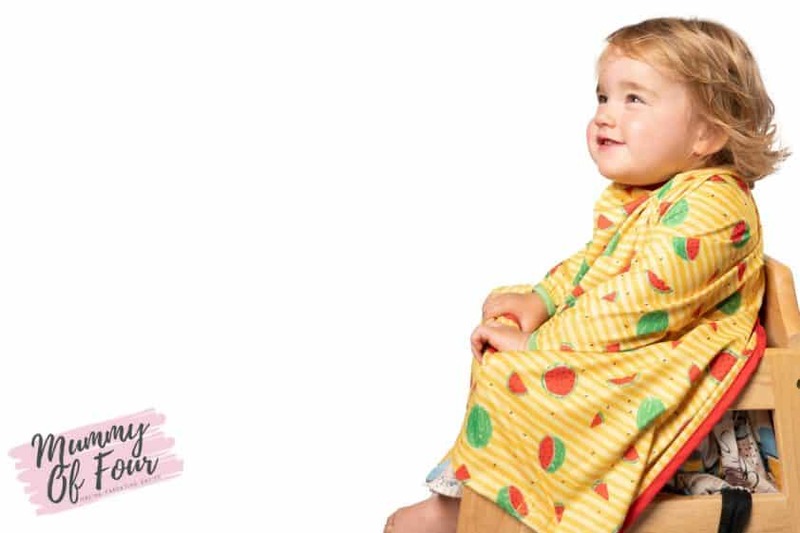 As you know, I take a lot of time and care and effort selecting the children’s outfits (yes, I’m a self-confessed childrenswear addict) and there is nothing more annoying that beautiful clothing ruined by food stains. Most bibs, even long sleeved bibs, still fail to adequately protect baby’s clothing. 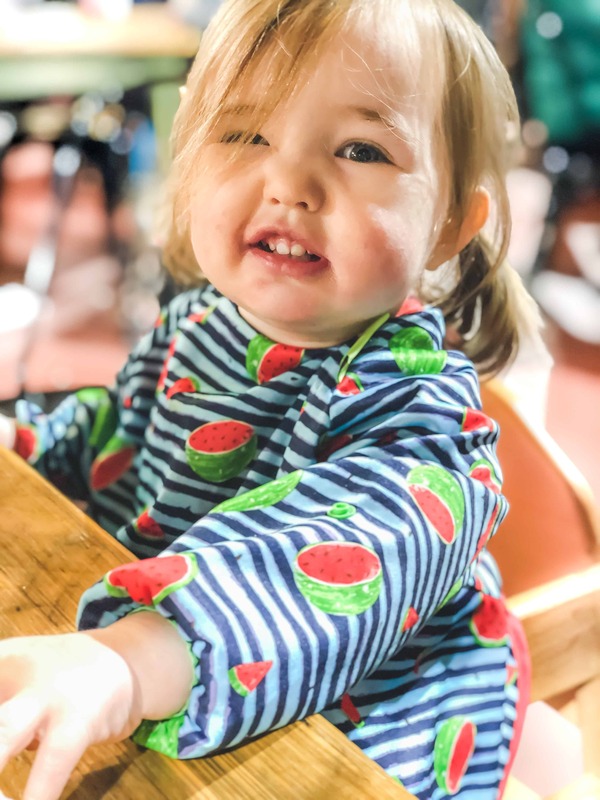 I have always favoured a long sleeve bib that covers down to their knees, but even these bibs did not save their laps, where food inevitablely collected. What makes the BIBaDO different? 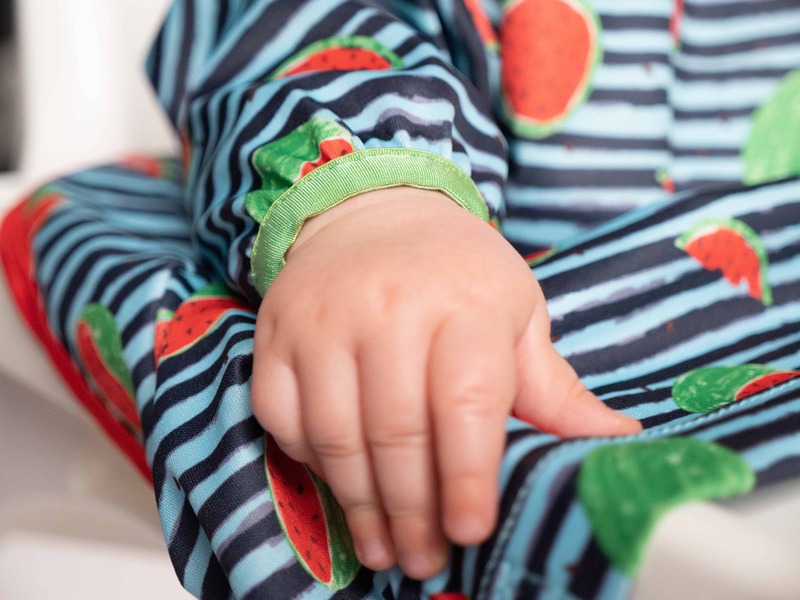 Not only does the BIBaDO protect the sleeves and body of the baby’s clothing, but it stops food dropping into their laps and being smushed under their wriggly bottoms too. (I cannot tell you how many pairs of tights we have previously lost to stains under the bottom where my child has sat in the banana / sauce / other mess that they have dropped into their highchair seat). 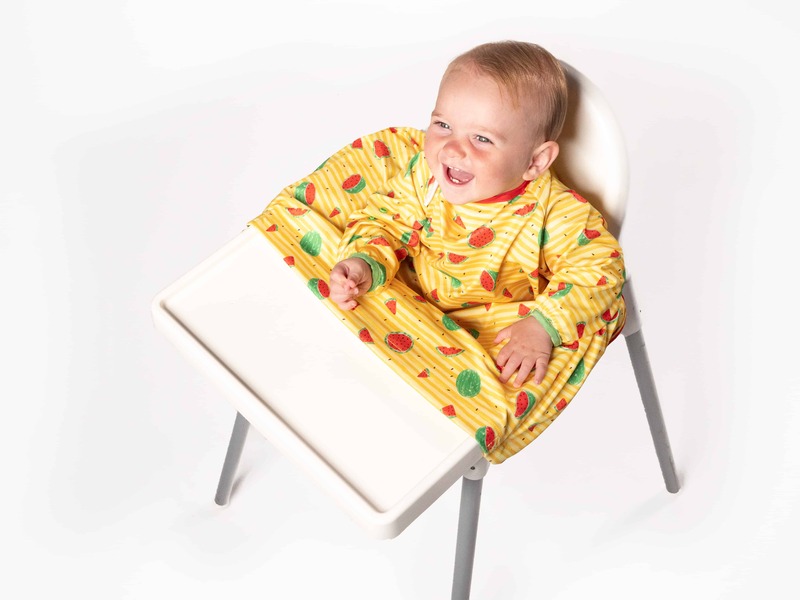 The bib covers the baby’s body and arms, then bridges the gap between baby and highchair. 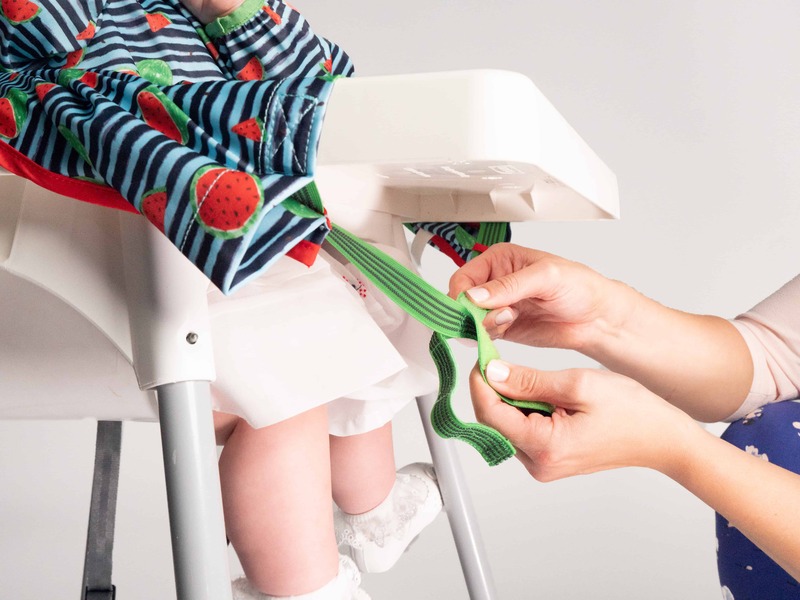 Velcro straps secure the BIBaDO to the highchair itself, meaning that all food and liquid dropped by baby is caught and collected in the canopy section. Does It Work With All Highchairs? 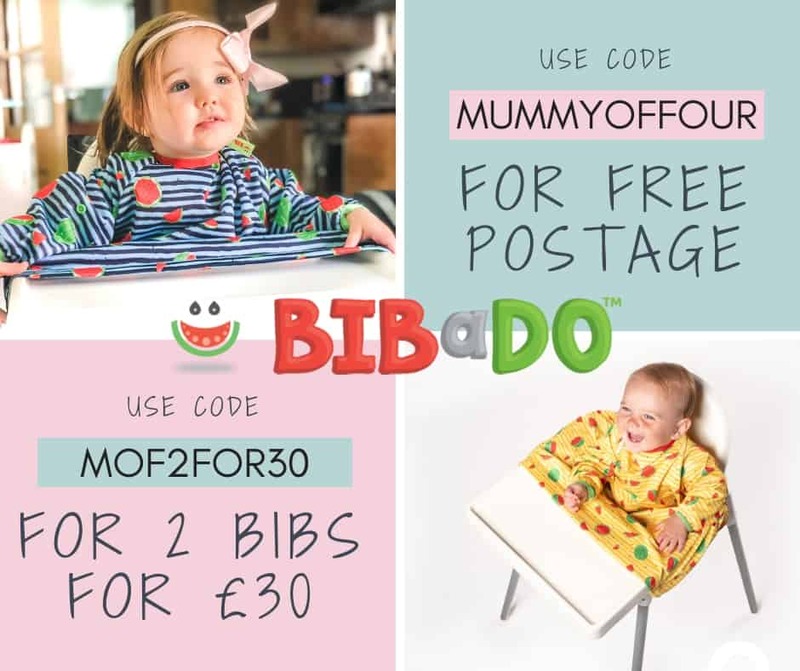 As you’ll know if you have read my Baby Led Weaning Essentials post, we have the IKEA Antilop highchair and the BIBaDO works perfectly with it. 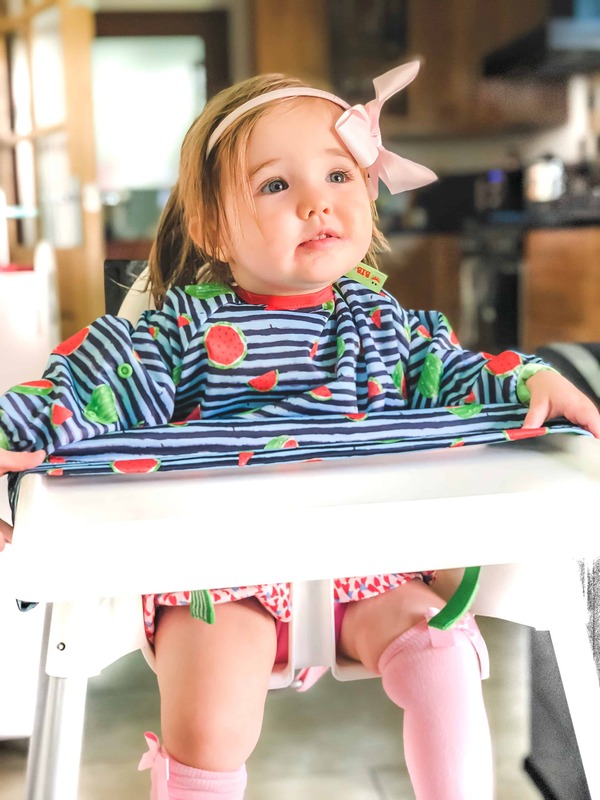 We have also taken the BIBaDO out and about and tried it with various other types of highchair, including the traditional wooden pub highchair and those with a tray. The BIBaDO works well with each type that we have tried. It’s also worth knowing that it’s super easy to take out and about as it folds up into its own special little pouch. This is escpically hand when it is covered in food and other baby gunk, as it keeps the icky sticky mess contained rather than spearding it all over your bag. Genius. Another use I have found for the BIBaDO is for when Zara is eating in the pram. 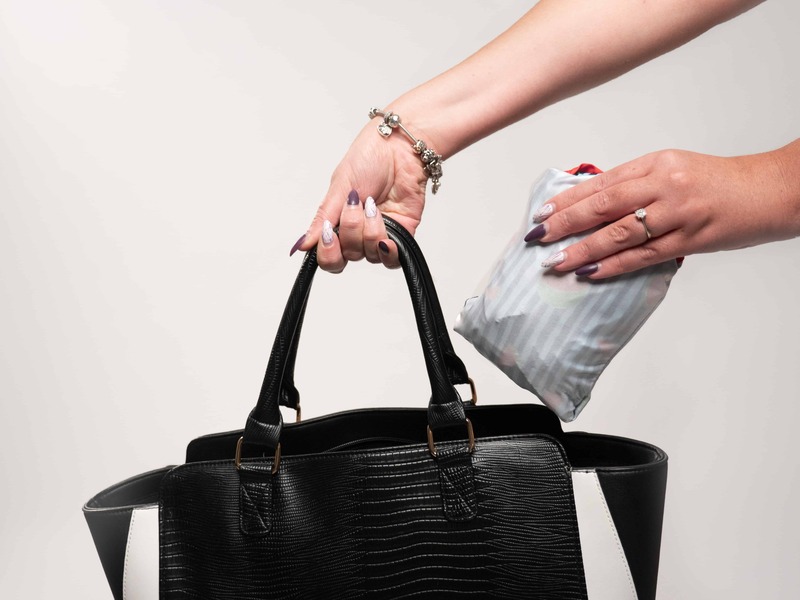 Snacking on the go can be a messy affair, leaving not only clothing and coats at risk of being messed up for the day or stained beyond repair but also the pram itself getting especially dirty. As our double buggy cost more than my first car, I am always keen to keep it as clean as is possible. I have found that the BIBaDO fits over Zara in the pram, even while she is still wearing her bulky winter coat. I cannot tell you how helpful this has been. 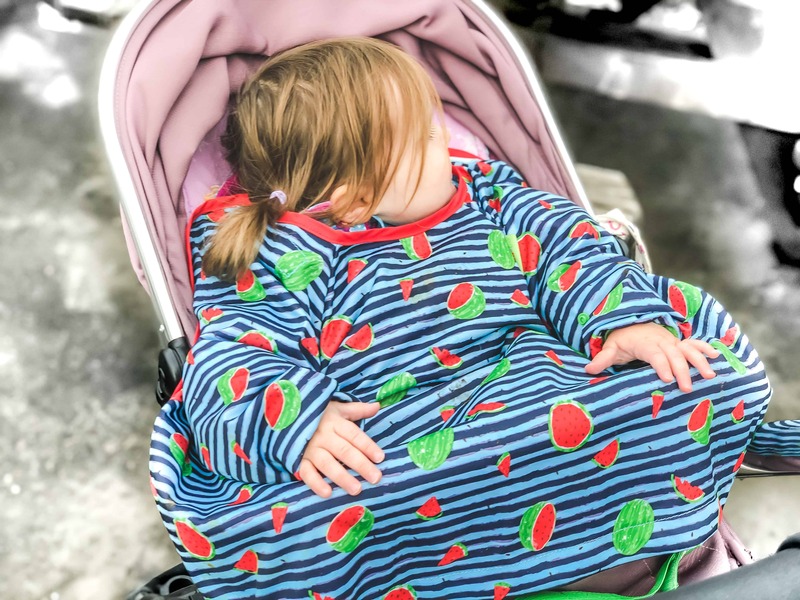 For example, when we were at Alton Towers over half term and she wanted a hot dog with ketchup to eat while sitting in her pram and wearing a pale pink coat, the BIBaDO saved the day. Seriously, this has been a game changer. What Are The Bibado’s Down Sides? I feel it is important to warn you that without proper care taken, the Velcro fastenings can cause damage to the bib plus other items in your machine. As with every washable item with a hook and loop fastening, ensure that you have stuck the velcro together before washing. This will stop the sticky side sticking to, pulling and ruining other farbics in your wash.
My only other request / piece of formative feedback for BIBaDO is that I feel a pink design is missing from the range. As someone who has a bit of a thing with pink (in that I love it), I would certainly buy a pink version for Zara if it was available. We have been using the BIBaDO regularly for the past few months and I am delighted to say that I think I have finally found the answer to meal time mess. When using the BIBaDO I am now able to abandon my previous practice of stripping Zara naked underneath her long sleeve bib, (which was previously the only way to ensure that any of her clothing could ever be worn again). I am now able to leave Zara dressed in even the palest of her pretty pink dresses and tights, safe in the knowledge that even the messiest of meals won’t get through the BIBaDO. Get your hands on at least 2, one on and one in the wash. Seriously, when you use this bib, you’re not going to want to use anything else. You can thank me later. 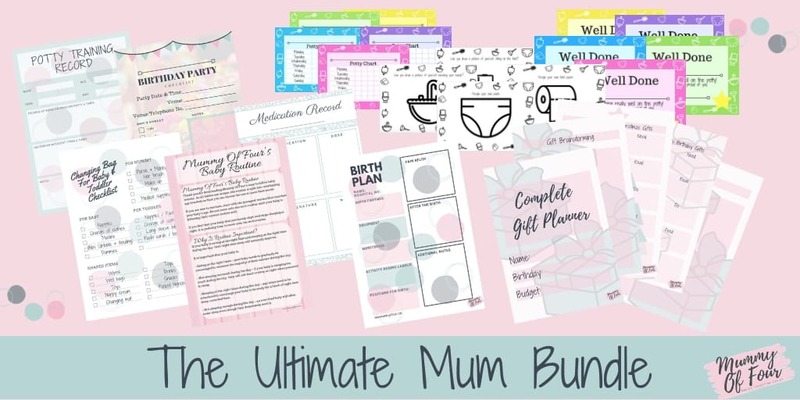 Fancy getting your hands on my Ultimate Mum Bundle of resources? Disclosure – This is a collaborative post contains. Tpost affiliate links, meaning that if you click through and make a purchase, I will make a small commission. Wow! What a great product! We use long sleeve bibs but even then my youngest still manages to get a lapful of cereal every morning.